While your gaze is drawn to the view, the little things become clear once again. And family is finally the definitive concept again. Alphotel is also in an ideal location for our guests who play golf. While we supervise your children, you have the opportunity to use the golf courses close by and wholly concentrate on improving your handicap. Enjoy a round with some professional instruction, or just a casual round. 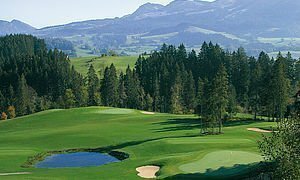 54 holes in total, nestling in the indescribably beautiful landscape of the Allgäu and Kleinwalsertal Alps, and accessible within 30 minutes, are here for you to enjoy a game on. There are more than 15 other courses, with up to 18-holes, which are accessible within 60 minutes for you to play on. 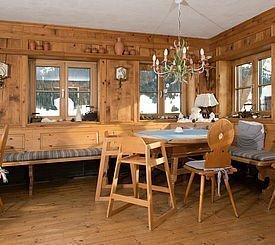 Guests of Kinderhotel Alphotel get a 30% discount on green fees. 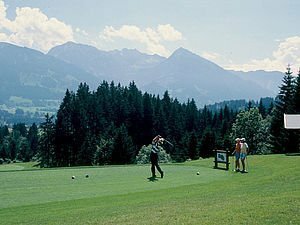 With the stunning panorama of the Oberstdorf mountains, in the uniquely beautiful Trettachtal, that’s where you’ll find sophisticated golfing fun! 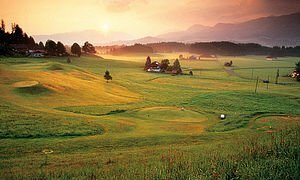 The mostly narrow fairways harmoniously nestle in fragrant mountain pastures, natural stream and river courses, moors and shaded forest glades. The characteristics of this terrace-like terrain mean that the course can be described as providing a sporting challenge and is far from stingy on difficulties. Good basic fitness and the ability to concentrate is therefore advantageous to be able to enjoy an exciting and relaxing, as it were, time playing golf. 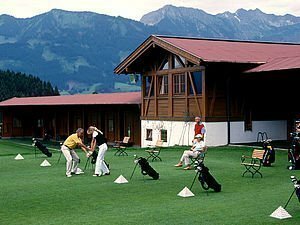 At all other times our guests enjoy the benefit of the fact that Alphotel is a "partner hotel to Oberstdorf golf club". Our guests receive a 30% discount on green fees.